National Poetry Month continues, and the poetry continues to arrive! Vancouver poet Edward (Ted) Byrne’s latest collection is now available. Order your copy today! 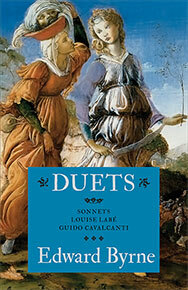 Duets consists of interpretative translations of sonnets by Louise Labé, who lived and wrote in sixteenth-century Lyon, and those by thirteenth-century Florentine Guido Cavalcanti. The reader will find herein ninety poems, equally “translations” of Labé and Cavalcanti and “versions” authored by Byrne. Each sonnet is made up of nine lines, each line, in turn, made up of nine syllables. The work’s main body is written in the manner of the serial poem, a practice whereby the composing mind passes from room to room – and from stanza to stanza – in a kind of trance, forgetting and remembering.